The buyer was a partnership of Palo Alto-based Menlo Equities, which owns the three-building, 198,000-square-foot Century Park II office complex at 8306, 8316 and 8326 Century Park Court. The Menlo Equities entity that acquired Century Park I is called Century Park Income Partners. Located at 8315, 8330 and 8335 Century Park Court, Century Park I is a 204,000-square-foot complex. The acquisition was financed with a $38.67 million U.S. Bank loan. Century Park I had previously been sold for $29.75 million in May 2003 to a venture of Cruzan|Monroe, a local investor/developer. Century Park I was then sold as part of a property portfolio to a unit of Los Angeles-based Lowe Enterprises for $61.3 million in 2005 on behalf of an institutional investor. Century Park I was subsequently sold to SD Power Property LLC, by Ampere Remainder LLC, with David M. Ledy as vice president in 2006. SD Power subsequently sold the property to Menlo. Neighboring Century Park II is at 8306, 8316 and 8326 Century Park Court. Both Century Park I and II were developed in phases by Nexus Development of La Jolla beginning in 1986, and both are 100-percent leased to San Diego Gas & Electric. A Menlo Equities partnership known as Kearny Mesa Office Partners LLC had paid $40.34 million for the Century Park II property in May of 2009. The Century Park I transaction was handled by Louay Alsadek, Brad Black and Evan August of CBRE (NYSE: CBG), who along with the brokerage's Kevin Shannon, were the brokers when Century Park II sold in 2009. "This was a strategic purchase for Menlo Equities which now owns the entire [six-building] campus," August said. Century Park has long been touted for its access to freeways such as Highway 163, Interstates 15 and 805, and state Route 52. "This is in a great location in Kearny Mesa and there is a direct onramp there to the [state Route] 163," August said. Menlo Equities officials couldn't be reached for comment, but August said the investor is planning significant upgrades to the property's interior spaces. "They're [Menlo] are talking about doing one building a year," August said adding that electric charging stations for plug in automobiles are part of the new additions. August said the upgrades will include improvements to the 8330 building, where many of SDG&E executives are located. With this latest transaction, SDG&E's lease term will be extended from 2017 to at least 2024, with other extensions possible. 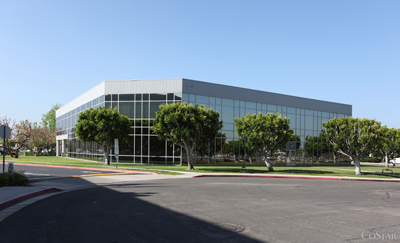 Menlo Equities owns 1450 Frazee Road in Mission Valley, a 140,486-square-foot building that Sunroad Enterprises developed in 1982. Menlo paid $18.4 million to acquire that building in February 2010. Menlo previously owned of the 171,969-square-foot 4 Points Business Park on Ruffin Road and Chesapeake Drive near Montgomery Field, which was sold for $21.2 million to Brookwood Financial Partners in June 2013. Menlo also owned the 112,380-square-foot Avenue of Science Center in Carmel Mountain Ranch before selling that property for $24.1 million in 2005. Menlo has also been active in Rancho Bernardo, where it owns or has developed numerous properties. The Palo Alto firm had also owned the 241,000-square-foot Discovery Corporate Center, which required the demolition of a 180,000-square-foot in the mid-2000s to make way for that project. Menlo Equities sold that property for $70.5 million in December 2012. A Rancho Bernardo property still owned by Menlo that also required demolition is located at 16350 West Bernardo Drive. The property is zoned for a 400,000-square-foot research and development complex, but a timetable for its development has yet to be determined.